Source: Produced in E. coli. Human PDI is fused at the N-terminus to a His-tag. Formulation: Liquid. In 50mM TRIS, pH 7.5, containing 150mM sodium chloride, 1mM DTT, 1mM EDTA, and 5% glycerol. Activity: Positive for disulfide isomerase activity, measured by promotion of insulin aggregation in the presence of DTT. Specific Activity: >200 U/mg. 1 U increases the A650 of a 1mg/ml insulin solution by .01 OD/min at 25°C in the presence of DTT. Scientific Background: The mammalian protein disulfide-isomerase (PDI) family encompasses several highly divergent proteins involved in the processing and maturation of secretory proteins in the ER by catalyzing the rearrangement of disulfide bonds. PDI, an abundant protein of the ER (>400uM), contains a carboxy-terminal retention signal sequence, KDEL, similar to that of BiP and Grp94. The PDI proteins are characterized by the presence of one or more domains of ~95-110 amino acids related to the cytoplasmic protein thioredoxin. All but the PDI-D subfamily are composed entirely of repeats of such domains, with at least one domain containing – and one domain lacking – a redox-active Cys-X-X-Cys tetrapeptide. In addition to roles as redox catalysts and isomerases, PDI proteins perform such functions as peptide binding and cell adhesion, and may conduct chaperone activities1. Platelet surface thiols and disulfides play an important role in platelet responses. Catalytically active PDI resides on platelet surfaces where it mediates platelet aggregation and secretion by reducing disulfide bonds, thus exposing fibrinogen receptors in platelets. 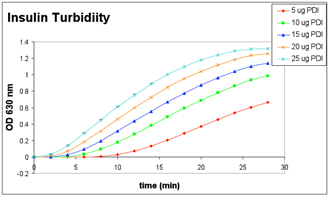 Enzymatic Activity: 1mg/ml insulin incubated with PDI in the presence of DTT – turbidity measured in 96-well microplate reader at 2 min intervals. Western Blot analysis: Lane 1: MWM, Lane 2: 50 ng PDI (human), (recombinant) (His-tag), probed with Prod. No. ADI-SPA-891. SDS-PAGE analysis: Lane 1: MW marker, Lane 2: 0.5µg, Lane 3: 1µg, Lane 4: 2µg, Lane 5: 5µg PDI (human), (recombinant) (His-tag).